Two decades after the 1994 genocide, Rwanda has moved to reestablish itself as an up-and-coming nation. The government plan for the country’s economic transformation, called Rwanda Vision 2020, has identified agriculture, particularly dairy cattle, as paramount because food security remains an issue. 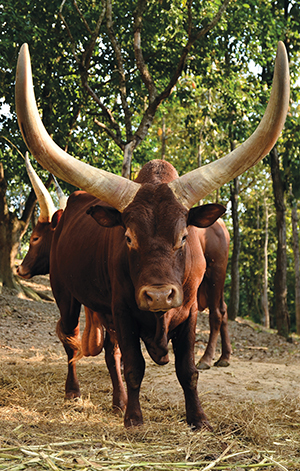 Faculty members at Cummings School of Veterinary Medicine are working with the young veterinary school at the University of Rwanda to support government efforts to boost milk production in the east-central African nation. According to a 2011 report by the International Livestock Research Institute, high-level veterinary services are needed for livestock to be productive even in developed nations—and Rwanda has a shortage of vets. Supported by $200,000 in grants from Cummings Foundation, faculty from Tufts are partnering with the College of Agriculture, Animal Sciences and Veterinary Medicine to establish hands-on training and other educational opportunities for veterinary students. Together, the two schools have launched Rwanda’s first mobile veterinary service, which treats livestock owned by families and farmers. Melissa Mazan, V93, section head for the Hospital for Large Animals, and Hellen Amuguni, a research assistant professor at Cummings School, worked with their Rwandan colleagues to buy and equip a truck that can transport 12 veterinary students on house calls to farms. Next on the to-do list is to establish a student learning center by expanding a library on the university’s Nyagatare campus. The team also plans to develop a diagnostic and teaching laboratory to offer one-stop shopping for tests related to agriculture and the health of humans, livestock and the environment. Cummings Foundation will make mini-grants to fund research by five Rwandan veterinary school faculty to pursue projects where there’s crossover between animal and human health, an area of inquiry known as One Health. “The idea is to encourage them to work more closely with faculty at the Rwandan medical school and other non-veterinarians, as well as with students,” who would gain laboratory experience as research assistants, says Amuguni. Back at Cummings School, students in the new One Health club are developing relationships with veterinary students in Rwanda. “They plan to meet online to discuss interesting cases seen [here and] in Rwanda,” Amuguni says.